VASSALBORO — Bailey Plourde of Lincoln Academy and Erin Holmes of Greely High each birdied the final hole of their high school golf careers Saturday to finish as Maine schoolgirl co-champions. So why was Holmes crying when she crossed the Natanis Golf Course parking lot on the way to record her score? In the boys’ competition, Logan Thompson of Mattanawcook Academy was the only player to break par. Thompson shot a 5-under 67 on the 5,876-yard Arrowhead layout to win his third straight Class C title, by eight strokes. Camden Hills sophomore Cole Anderson repeated as the Class A winner. His 1-over 73 on the 6,077-yard Tomahawk course edged Lucas Roop of Gorham by a stroke. Eric Dugas, a senior at Maine Central Institute, shot 73 on the Tomahawk course to win Class B by four strokes over Tyler Worcester of Fryeburg Academy. Holmes said she thought she was trailing by a stroke going to the final hole. She made a twisting 15-foot uphill birdie putt, but thought she had lost when Plourde made birdie with a 6-foot downhill putt. Plourde, a three-time champion, knew otherwise. “I knew I needed to make mine to tie. When she made the putt I was like, ‘wow, I really need to make this.’ Quite the pressure on that putt, but I had the confidence that I could make it,” Plourde said. Both players finished at 1-over 73 on the Arrowhead course. Plourde shared the title as a freshman in 2013 and beat Holmes by two strokes in 2015. Plourde and Holmes have played against each other multiple times over the years and both intend to play in college. 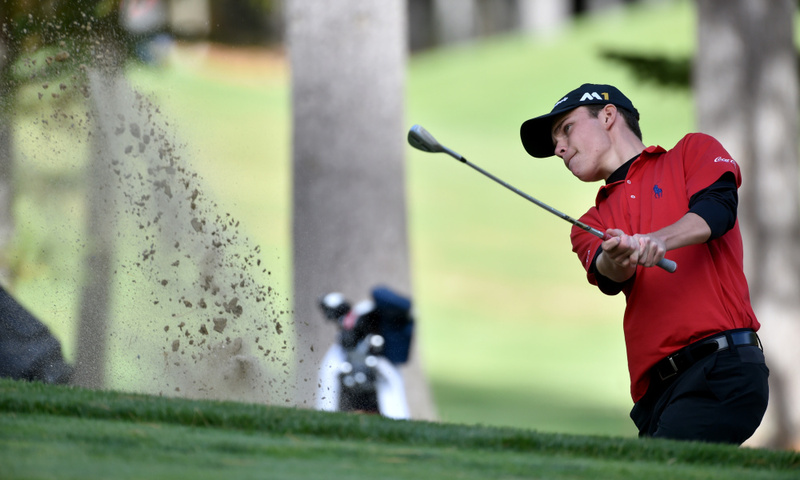 Thompson, a junior, capped a year that included the Maine Junior Championship this summer and the low round of 68 last Saturday on the Arrowhead course to lead Mattanawcook to the Class C team championship. No boy has won four state titles. Whitney Hand of Bucksport was the girls’ co-champion four straight years (2003-06). Anderson’s length off the tee and high approach shots with lots of spin helped him go eagle, birdie, birdie, birdie on the four par-5s. When he tapped in a short birdie putt on the 15th hole (his 16th hole of the day), he had a three-shot lead with two holes to play. Anderson had consecutive approach shots spin off the green on his final two holes, leading to a double-bogey, bogey finish. Roop three-putted the next-to-last hole for his second bogey of the round. He did not make a birdie, and said he’d like to have a second chance at his third shot on the par-5 14th. Dugas capped his victory in Class B with a birdie on his final hole. His brother, Gavin, won the Class B title in 2014.